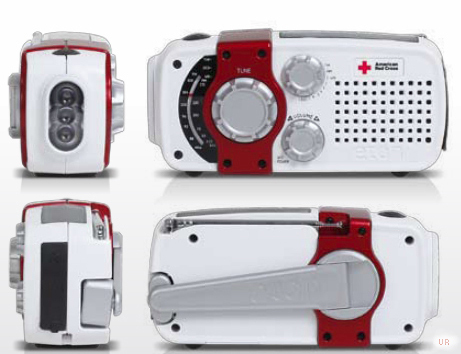 Be prepared and aware with the Eton FR170 Microlink emergency radio. 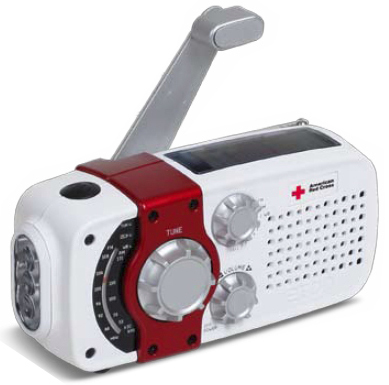 This very compact portable receives AM, FM and seven NOAA weather channels. The FR170 operates from a supplied rechargeable NiMH battery pack. This battery pack may be recharged from the wind-up generator or solar-cell panel on top of the radio. It can also be recharged via a USB cable (not provided). Plus there is a built in three LED flashlight! There is also a mono 3.5mm earphone jack (earphones not supplied). You can even recharge your cell phone with the FR170. The USB dump charge instantly charges your USB device after cranking, to get power when you need it most (USB cable not included). The Microlink is only 5.375 x 2.5 x 2.25 inches and 8.6 ounces. Get one for your glove compartment.